IBS treatment is the holy grail for us irritable bowel syndrome sufferers. Wouldn't it be great if there was a simple cure for this life disrupting disorder. Unfortunately at the moment most therapies are aimed at treating the symptoms rather than offering that 'life giving back' cure. Do not give up hope though. I now live my life largely untroubled by my diarrhea predominant irritable bowel syndrome and I am sure you can too. I would say though that everyone is individual and each person experiences their IBS in their own way, with some symptoms being more troublesome than others. With this in mind it is important to target those symptoms which are giving you the most aggravation. For me the IBS treatment which revolutionized my life the most was a course of hypnotherapy sessions with a trained practitioner who specialized in treating irritable bowel syndrome. The twelve sessions I had were part psychotherapy, where we talked about the ups and downs of life with irritable bowel syndrome, then hypnotherapy to teach me how to take control of my own bowels. They slowed down from 10-12 episodes of diarrhea throughout the day, to 2 bowel movements before breakfast. Sometimes the second bowel movement will be a bit loose but then usually I will not open my bowels again until the next day. I was pleased that hypnotherapy is a natural IBS treatment that does not involve taking any drugs. I do not believe that IBS is caused by stress but as we all know stressful events can cause anybody's bowels to play up and if you have nerve damage then this would be more likely. So was it the psychotherapy which helped or the hypnotherapy or both? It has been shown that people with past traumas in their lives are more prone to developing IBS but the reason is not clear. I did not have any past traumas in my life but I did find it helpful to talk through some problems I was having, however, I think that the major thing which helped me was the hypnotherapy. I learned self-hypnosis and how to slow down the motility of my intestines if I sensed that they were starting to speed up too much. If I got a little bit of pain, churning or gas I could take 10 minutes out and just sit quietly and 'talk' to my bowels and get them to behave themselves and then they would just calm down. The times when I had to do this became less and less frequent and my life became more and more normal. So maybe nerve damage meant that my nerves could no longer work efficiently on their own and I had to take charge and retrain my subconscious? Not everyone has access to a hypnotherapist trained in this IBS treatment or indeed can afford it but another option is to try an IBS hypnotherapy audio program (either downloaded or on CD). Two which have been recommended to me are by Michael Mahoney and also by Hypnosis Downloads. As has already been mentioned psychotherapy is sometimes used as an IBS treatment. If you have a history of abuse or past trauma this can in certain cases precipitate IBS and so psychotherapy could help you. 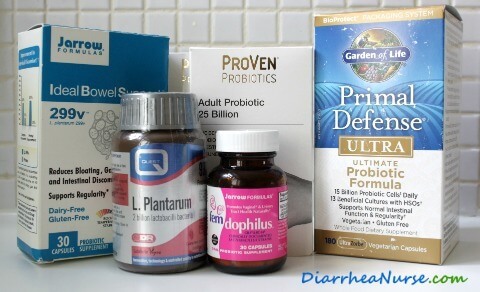 My hypnotherapist suggested to me that after finishing my course of treatment I should invest in some high quality probiotics because as she put it "having several bouts of diarrhea every day for years is not going to do your friendly gut bacteria any favors"! My stools were already firming up and my bowel movements had reduced dramatically in number when I started on the probiotics but I do think that they helped as I noticed that my stools were a better consistency and less smelly. I used a variety called ProVen which was successful as an IBS treatment in clinical trials at Sheffield University UK. Other probiotics are also good but look for preparations which are proven to have survived the stomach acid and have enough bacteria in them to make them worthwhile. There are many low quality products on the market which have low numbers of bacteria in them, do not make it as far as the colon or have not been stored properly and so the product is no longer live. Look for quality. Symprove, Garden of Life Primal Defense Ultra and VSL#3 are very good. In trials a particular strain of bacteria, Bifidobacterium Infantis (B. infantis 35624) was shown to be a more effective IBS treatment than placebos at reducing pain, bloating and stool difficulties. It is marketed as Align Probiotic Supplement in the US. It was launched in the UK in 2017 under the name Alflorex. A trial at King's College Hospital London had good success using Symprove. Some people have had very good results treating their diarrhea with a friendly yeast called Saccharomyces boulardii. It has been shown to reduce the number of bouts of diarrhea in people with IBS-D and other types of diarrhea and so could be tried as an IBS treatment. A new area of research also shows promise for the idea of alleviating the depression and anxiety which can accompany IBS with probiotics. Until recently it was thought that commercially produced probiotics could not permanently colonize the gut to treat IBS but recent research has shown that although stool samples do not often show evidence of the bacteria after consumption has stopped, if a sample is taken from the intestinal mucosa (lining) then some bacteria is implanting. Some strains seem to be better at doing this than others but research is ongoing. I do not take probiotics all the time but I top up my good bacteria every few months and I am careful to include prebiotic foods in my diet to fertilize my microflora and keep them well fed in between times. The science of the gut microbiome has a long way to go but increasingly evidence is coming to light that although we all have our own individual mix of friendly microbes people with problems may have a disturbance in their microbiome. It may be less diverse than normal or out of balance with one or more bacteria being dominant. In future IBS treatment in some cases may revolve around therapies which can address these imbalances in the individual. Be aware that if you are immunosuppressed you should not take probiotics. Opinion is divided about whether food intolerance is a cause of irritable bowel syndrome and whether excluding certain foods from your diet can be used as an IBS treatment. Some people however do feel that food intolerance is at the route of their problems and that they benefit from excluding certain foods from their diets. Be careful though not exclude whole food groups as this can lead to poor health. 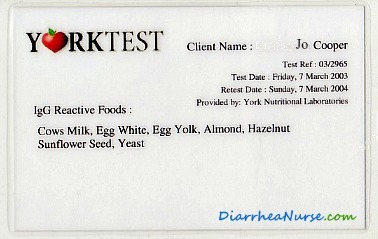 Long before I discovered hypnotherapy and probiotics I got tested for food intolerance using the well known home blood test kit, YorkTest. It came back that I had tested IgG positive for cows milk, egg white, egg yolk, almond, hazelnut, sunflower seed and yeast. I duly cut these foods out of my diet in an effort to treat my IBS except that I did not manage to cut out yeast entirely. Did it help? Well yes I definitely did see an improvement. My symptoms reduced and I no longer had the massive reaction I had suffered if I ate almonds for example. I was still suffering though and would still worry as my bowels would be unpredictable and I would suddenly need to go at odd times. Perhaps I should have stuck to the diet a bit better! Some doctors and scientists do not think there is sufficient evidence at the moment to treat IBS like this and to show that an IgG reaction is enough to prove an intolerance to a given food. More trials need to be done. However, if you do think it is worth getting tested and trying this as an IBS treatment then use one of the blood tests which is done in a lab. Do not go down the route of some other tests being offered on the internet. Weirdly, I did not eat these foods, apart from a little bread for many years and then my hypnotherapist said that I could re-introduce them as she explained that my brain/gut had learned to react to them even when I did not consciously know I was eating them and that following her treatment it would be OK. I did start eating them again with no problem. I do not know if the period not eating them had reduced my sensitivity to them or if she was right and the hypnotherapy had somehow altered my brain/gut's reaction to them? There is not one IBS treatment diet for everyone as it does depend on an individual's symptoms but dietary changes can be very helpful for some people. There is some general advice. It is a good idea to keep a food diary so that you can notice if any particular foods or pattern of meals is a trigger. Large meals stimulate the gut more than small ones so it makes sense to eat little and often. Fried and fatty foods are more likely to stir up the gut as well, so cut down on these. If you are suffering from constipation always eat breakfast as this meal is more likely to prompt the bowels to open than other meals. It has been found that contrary to advice given in the past high fiber diets exacerbate the symptoms of most IBS sufferers including those with constipation. Avoid wholegrain foods and especially foods containing bran. A lower fiber diet is therefore beneficial. The rules I follow revolve around trying to eat a varied diet based around food which is prepared from scratch and is not made in a factory. This means I will be found at the farm shop and the farmers' market or in local specialist shops like our great local bakery and at the fish van which visits our village every Wednesday with fresh fish just off the boats in Lowestoft. If you are uncertain about your diet or feel that you need some help then it makes sense to see an expert in nutrition to advise about your diet in general or about the specific diets mentioned below. Make sure that you go and see someone who is properly qualified. In the UK you can find someone close to you by visiting nutritionist-resource.org.uk. The low fodmap diet was developed as an IBS treatment in Australia where scientists found that foods containing short chain carbohydrates called fodmaps cause symptoms in many people with IBS. They are poorly absorbed in the small intestine and they ferment, leading to gas, bloating and pain. The list of foods high in fodmaps is quite long but includes fruits, dairy products and many vegetables especially onions and legumes. It is best to follow this diet under the supervision of a dietitian. It should be followed for a period of about 8 weeks and then the offending foods gradually re-introduced. It is not designed as a diet for life because the dilemma is that the very foods that you are eliminating are the ones that your friendly gut bacteria like but perhaps an imbalance is causing them to produce excessive symptoms? It has been found however by researchers at Kings College London that up to 70% of people with IBS can reduce their intestinal symptoms with this diet. Eliminated foods should however be gradually re-introduced on a try it and see basis. A small subset of people with IBS are sensitive to gluten. They do not have full blown celiac disease but they do improve if they remove gluten containing foods from their diet. This means cutting out foods containing wheat, barley and rye. Gluten free products are available and for some people it could be worth trying this diet for a period of time to see if their symptoms improve. Dutch scientists have found that up to 20% of people with a diagnosis of irritable bowel syndrome lack the digestive enzyme lactase which is needed to digest lactose, the sugar found in milk and other dairy products. It therefore follows that these people can use a low lactose diet as an IBS treatment to reduce their symptoms by cutting most dairy products from their diets. We do not have the space here to discuss this diet in detail but be aware that the harder a cheese is the less lactose it has in it. It is also now possible to buy lactose free cows milk, cream other dairy products. Lactaid is a popular brand in the US and in supermarkets in the UK you can buy Lactofree. Certain supplements can be a useful IBS treatment to keep symptoms at bay. Peppermint oil capsules can be bought over the counter as Colpermin, Mintec and Apercap . They can be used when you have a flare up to ease abdominal pain, bloating and wind. They work by relaxing the smooth muscles in your bowel. They are not designed to be taken permanently. Be aware that they can cause side effects in some people such as burning around the back passage and heartburn which is more likely if you drink alcohol at the same time. Digestive enzymes speed up the breakdown of food in our digestive system. If you have a deficiency of these enzymes then food will break down much more slowly giving rise to symptoms like gas, bloating, heartburn, constipation, and pain. Some people have found that taking digestive enzymes before meals is an effective IBS treatment. These enzymes can be bought over the counter in most countries. Glutamine sometimes called L-glutamine is an amino acid which has been shown to reduce intestinal permeability. It is often used after abdominal surgery to prevent infection. The cells lining the intestinal tract can be damaged and no longer provide the barrier that they are designed for. When this happens substances can leak into the blood stream. One theory says that this sets up an inflammatory immune response leading to many different disorders including irritable bowel syndrome. It is established that so called leaky gut can happen as people with Crohn's Disease and also Celiac Disease are known to experience this but it is a bit of a chicken and egg situation. It is not established whether having a leaky gut leads to things such as Chronic Fatigue Syndrome, Fibromyalgia and IBS or whether having these types of disorders can cause the gut to become more permeable in some people and indeed whether this causes them any problems. However, many people believe that the healing action of glutamine on the intestinal wall is a helpful IBS treatment. There have been reports that supplementation with vitamin D3 used as an IBS treatment has helped some people overcome their symptoms. So far the evidence is only anecdotal but researchers at Sheffield University did a search of IBS forums in 2012 and found quite a few sufferers self reporting relief after sorting out their low vitamin D levels. A trial reported in the Oman Medical Journal in March 2015 did indeed report that IBS sufferers were more likely to have vitamin D deficiency than other people. Coincidentally, a year after my success with hypnotherapy I had my vitamin D levels tested and they were very low. I corrected them with Vitamin D3 supplements. I have wondered if this has helped me to stay symptom free? If you are pregnant, breastfeeding, taking other types of medication or have other long term health conditions then always check with your doctor before taking any new medication or supplements. The antibiotic rifaxamin has been used as a successful IBS treatment in some cases but this is only where there is small intestinal bacterial overgrowth. The symptoms of IBS and SIBO do overlap but people with small intestine bacterial overgrowth usually have excessive bloating and can suffer with weight loss and malnutrition if it is severe. This treatment which is normally used for traveler's diarrhea has been licensed for use in IBS-D in the USA. Some people have found relief for weeks or even months but often need to repeat the treatment (this can be done up to two times). It does not work for everyone and it remains to be seen whether a permanent cure is possible. This type of medication relaxes the muscles in the wall of the intestine and so can be helpful if you are suffering from spasm like pain. The main anti-spasmodics are hyoscine butylbromide (Buscopan) and mebeverine hydrochloride (Colofac). This medication is not designed to be taken permanently but when you have a flare up. It is questionable how effective these drugs are as an IBS treatment as they do not always get rid of the pain entirely. However, some people find them useful in reducing the severity of their symptoms. Surprisingly antidepressants can be used to treat pain as they alter the way we perceive pain which is a separate effect from their antidepressant qualities. Antidepressants are only used as an IBS treatment in cases where other methods have failed because they have to be taken all the time to be effective. Standard laxatives like lactulose are not normally recommended as an IBS treatment for people with IBS-C as they can make symptoms like wind, bloating and pain worse but they are sometimes used for very short periods under medical supervision. Foods containing soluble fiber have already been mentioned and these can help those with constipation. Ispaghula husks (sometimes called psyllium husks) contain a lot of soluble fiber and have been recommended to help to ease constipation. Plenty of fluids should be taken alongside this stool bulking agent as obstruction and choking can occur if they are too dry. Fiber supplements can be useful short term but it is better to try and get your fiber from your diet. In 2012 linaclotide marketed as Constella or Linzess was approved as an IBS treatment for people with IBS-C in the US and Europe. It reduces pain and acts on the smooth muscles of the bowel to promote bowel movements and lessen the chance of constipation. It was launched in the UK in 2013. This type of medication slows down the passage of feces through the intestines by decreasing the ability of the muscles to contract. It is therefore useful in treating diarrhea. The most commonly used ones are loperamide (Imodium) and dephenoxylate (Lomotil). I must confess that for years I would not go anywhere without some Imodium in my bag. I would also take it as a preventative before doing anything where I might find it difficult to get to a bathroom. Teagaserod, a very effective IBS treatment for people suffering with IBS-C was withdrawn from the market in many countries around the world in 2007 due to heart related side effects. The manufacturer Novartis maintained that the affected individuals had pre-existing heart conditions. Many online pharmacies are still selling this medication but do be very wary as you do not know how genuine it is and also there have been reports of money scams. Massaging the abdomen in clockwise direction following the direction of the colon can help alleviate constipation. Start between the right hip and the belly button. Go up the ascending colon then across the transverse colon just below the ribs and then down the descending colon on the left side and then across the sigmoid colon to the middle under the belly button. You can either use your finger tips with one hand on top of the other or a fist or some people use a tennis ball in a circular motion. Take your time and do not press too hard. This type of self-massage if done daily can be an effective IBS treatment and help to replace the peristaltic wave action which is very slow in people with constipation predominant irritable bowel syndrome. It can also help move gas along thereby reducing bloating. So do it somewhere private! The medical profession does not support colonic irrigation as they do not think that the colon needs to be washed out, as they say that it is self-regulating which up to a point is true. They are also worried about the side effects. A rare but possible danger is perforation of the bowel. Another problem is that good bacteria are washed out along with everything else. Some people suffering from IBS with constipation have however found relief using this expensive treatment. Others have found that they have become a bit dependent on their treatments and that possibly their colon has become even more sluggish. Exercise is very beneficial for people with irritable bowel syndrome, although it is understandable that many people avoid it as they have a fear of accidents happening or they just feel too under the weather to participate. If you have constipation then any form of exercise can help to get things moving. Being sedentary will make your constipation worse. If you have diarrhea do not run, as runner's diarrhea is a real thing but pilates will help to strengthen your core and your pelvic floor helping to keep your feces in place for longer until you can get to the bathroom. This has definitely helped me. Exercise will also improve your general health and this will make you more able to cope when you do have symptoms. The best types of exercise for IBS treatment are brisk walking, pilates and yoga but anything that you are comfortable with will be beneficial. Stress does not actually cause irritable bowel syndrome but it can make it worse so anything to reduce stress is a good idea. As has already been mentioned exercise can have physical benefits but it can also help to reduce stress and anxiety as it helps to dissipate the hormone cortisol (the stress hormone) which builds up when we are anxious. It has been shown that high cortisol levels can make IBS worse. Things to try are yoga, pilates, tai chi, walking, meditation, and breathing exercises. When discussing IBS treatment it is difficult to say that one size fits all. There are probably different sub-sets of irritable bowel syndrome with different causes and therefore with different treatments. At the moment reducing or eliminating the symptoms is the best we can hope for as the causes are not clearly understood even though a new test is now available for IBS-D and IBS-M. I remain largely symptom free since my breakthrough in 2009 with only a bout of diarrhea maybe once every six months. So do I consider myself to be cured? I wouldn't say that, as although I lead what I consider to be a normal and busy life when I took on a new project in 2012 which was very full on and out of my comfort zone my symptoms did start to creep back. I went to see my hypnotherapist again and she said that although the hypnotherapy was keeping my symptoms at bay, there are limits and I was pushing it too much. I scaled back a bit and things settled down again. I am not trying to pretend that my experience is the answer for everyone but I hope that this article has been useful and that if you are suffering with irritable bowel syndrome, one or more of these IBS treatments will help you find some relief. If you would like to read about some other experiences that people have had with IBS and hypnotherapy, probiotics and the fodmap diet then please read this newspaper article. I have now had the diagnosis of IBS-D for 18 years but have not been suffering much at all since 2009. Things changed a bit this year. 2017 was a bad year in our family with deaths and illnesses piling on the stress. By the beginning of 2018 my guts were starting to play up again a bit. I was still symptom free for most of the day but I would wake in the early hours of the morning and then after waking the abdominal pain would start. I would have to visit the bathroom 3 or 4 times and my motions were definitely getting looser. Gradually my sleep got even worse and I ended up with toothache and a permanent headache. My amazing dentist was the one who sorted everything out! He realized that I was grinding my teeth (bruxism) during my sleep and this was probably causing my headaches. He recommended a night guard which I started wearing on my bottom teeth. I immediately started sleeping deeply and waking at 7am instead of 4am! Even more miraculously my abdominal pain stopped and my bowels calmed down. This made me wonder if there was a link between sleep and IBS and do you know when I did the research the scientists had got there before me. They had just started researching this very area! So can fixing your sleep be used as an IBS treatment? Studies have shown that people with disturbed sleep or insomnia are more likely to suffer IBS symptoms the next day, especially abdominal pain just like I did. They even treated some people with melatonin which is a hormone which regulates the sleep/wake cycle and can be used to treat sleep disorders. They found that people with IBS who took melatonin had fewer symptoms. If you live in the USA melatonin can be bought over the counter in pharmacies and health food shops but not in the UK. 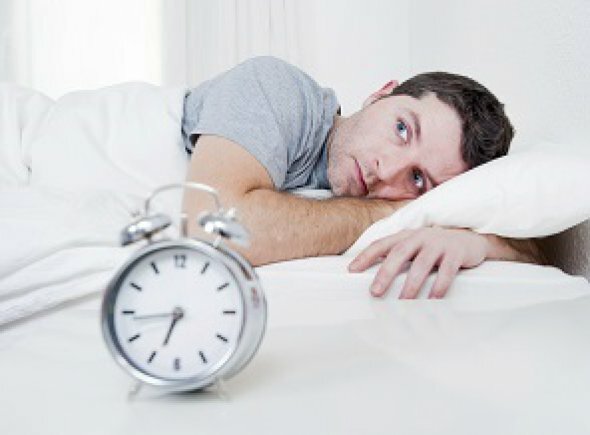 This is one thing that can help with sleep problems but there are many other ways of improving the length and quality of your sleep such as sleep hygiene. These were small studies and more research needs to be done but it looks as if fixing poor sleep could be a viable IBS treatment! Find out here all the details you need to know. There is an epidemic of IBS symptoms going in our modern world. Are you affected? Irritable bowel syndrome symptoms are not just confined to the gut they can affect many different parts of the body. Get more information here. This diet researched by a team at Monash University Australia has helped many people with difficult to live with gut symptoms.